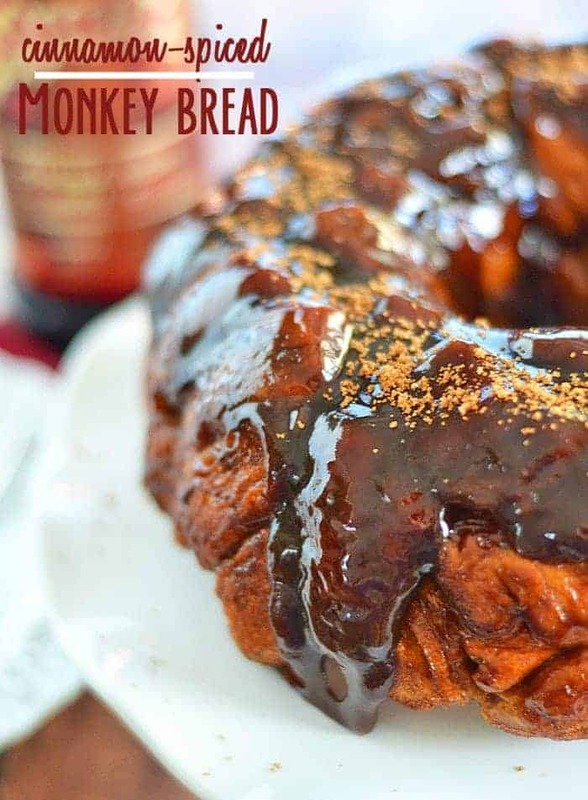 This Cinnamon-Spiced Monkey Bread with a Kahlúa-caramelized glaze is sure to be a hit during your holiday festivities. Bonus? It’s super simple! 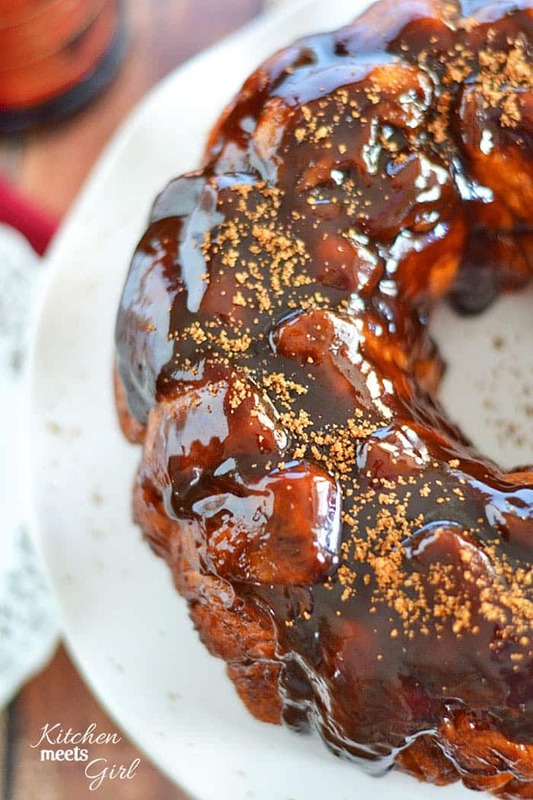 And when it comes to wintertime sweets, I love to curl up with the flavors of cinnamon and molasses – two of the primary ingredients in this easy monkey bread. Sure, you can make your own dough, but I’m often looking for instant gratification when it comes to sweets, and this breakfast (dessert?) can be in your mouth in less than 30 minutes. I used 2 rolls of Grands biscuits for the bread, and I rolled the pieces in a combination of cinnamon and dark brown sugar. I loved using dark brown sugar here because it gave the bread a deeper flavor than light brown sugar – but feel free to substitute if you don’t have dark brown sugar on hand. The glaze? Super easy and made in the microwave in just one minute–with more brown sugar, cinnamon, molasses, and one ingredient that pushed this decadent treat right over the edge: Kahlúa Cinnamon Spice. Quite frankly, coffee is a requirement for me at breakfast – and also oftentimes alongside my desserts, especially on a cold winter night. So yeah, try pairing this Kahlúa Cinnamon Spice coffee alongside the monkey bread. Believe me, wintertime treats have never tasted better. Preheat oven to 400 degrees and grease the inside of a 10-cup Bundt pan. Place 1 cup brown sugar and 1 tablespoon cinnamon into a gallon-sized Ziploc bag. Open biscuits and cut each one into four pieces. Drop a few biscuit pieces at a time into the mixture of cinnamon/sugar and shake bag to coat. Place biscuit pieces into bundt pan and repeat, until all pieces are coated. In a large microwave-safe bowl, combine butter, brown sugar, cinnamon and Kahlúa. Microwave on high for 1 minute, or until butter is melted. Stir to combine, then pour over the dough in the bundt pan. Bake at 400 for 20 to 25 minutes, or until dough turns golden brown and springs back lightly when you press on it with your finger. Allow to cool for about 10 minutes in the pan, then invert onto a serving plate. 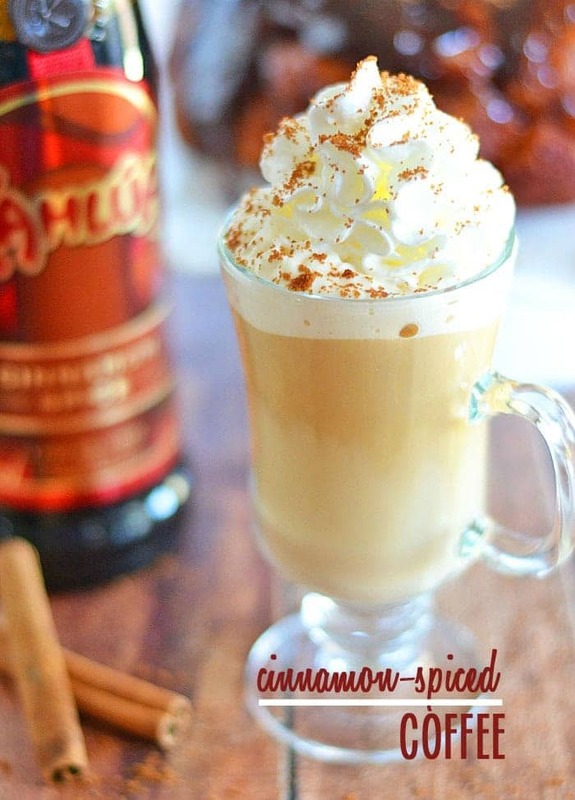 To a cup of your favorite coffee, add 1 part Kahlúa Cinnamon Spice, 1 part cinnamon simple syrup, and 1 part cream/milk/half-and-half (I used about a tablespoon or so of each, but adjust to your own tastes). In a heavy bottomed sauce pan, combine 1 cup sugar, 1 cup water and a cinnamon stick over high heat. Bring to a boil and then reduce to medium-high heat, stirring occasionally. Allow syrup to cook over medium-high heat until syrup reduces by half, or about 10 minutes. Store covered in refrigerator for up to one week. Be sure to follow Kahlúa on Facebook and Pinterest.